Fleas are truly devoted to their work. In one day, a single flea can bite your cat or dog more than 400 times. During that same day, the flea can consume more than its body weight of your pet’s blood. And before it’s through, a female flea can lay hundreds of eggs on your pet, ensuring that its work will be carried on by generations to come. Flea bites may be merely a nuisance to some pets, but to others, they can be dangerous. They can cause flea allergy dermatitis—an allergic reaction to proteins in flea saliva. A pet’s constant scratching to rid itself of fleas can cause permanent hair loss and other skin problems. A pet can get a tapeworm if it eats a flea that has one. And flea feasts on your pet’s blood can lead to anemia and, in rare cases, death. But fleas are not your pet’s only nemesis. Tick bites can give your pet such infections as Lyme disease, ehrlichiosis, and Rocky Mountain spotted fever. And ticks can give those same infections to you. Hundreds of pesticides, repellents, and growth inhibitors are approved or licensed to control fleas and ticks on cats and dogs or in their environment. Products range from oral medications that require a veterinarian’s prescription to collars, sprays, dips, shampoos, and powders that are available at retail stores. Some products kill only ticks or adult fleas—others break the flea life cycle by preventing flea eggs from developing into adult fleas. Some flea and tick products are not prescription drugs, yet are available only through veterinarians. This is because the manufacturer chooses to sell its products through vets, so that the vet can provide important safety information to the client. The Preventic collar is one such product. The collar kills ticks by interfering with a tick’s ability to feed on dogs. It contains the insecticide amitraz, which paralyzes the tick’s mouthparts. Amitraz should not be used on dogs that are sickly, pregnant, or nursing, or with certain drugs that may interact with the insecticide. The manufacturer, Virbac Corp., Fort Worth, Texas, sells the collar through veterinarians, who can ensure that a dog is healthy and can use the collar safely. It’s best to treat your pet year round. The severity and length of the flea season vary depending on which part of the country you live in. It can last four months in some places, but in other places, like Florida, fleas can live all year long. 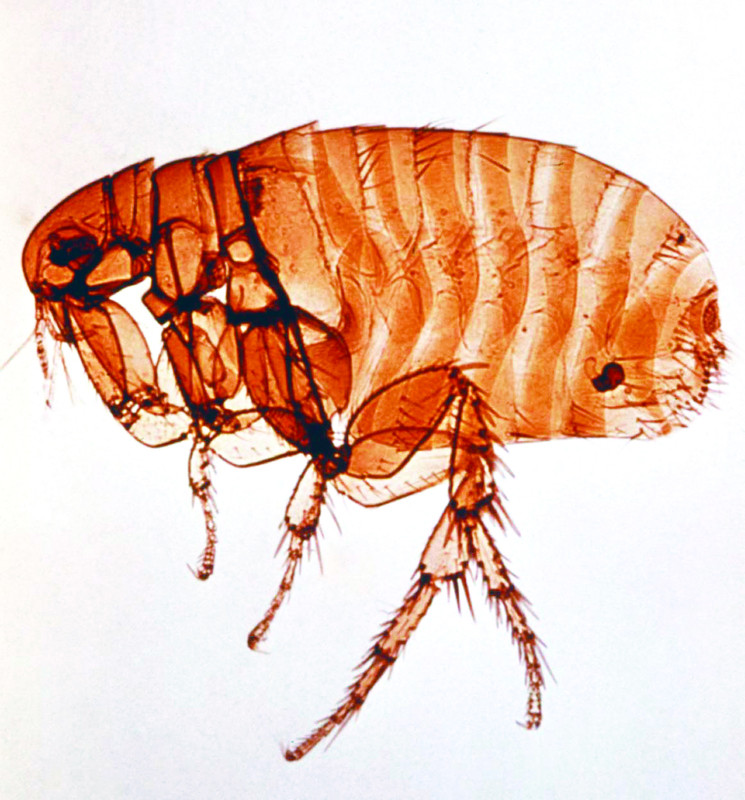 Fleas can also live inside a warm house year-round. In many areas, September is often the worst month for flea infestation. In most parts of the United States, the greatest chance of infection by a tick bite is May through September, the period of greatest tick activity by “nymphs.” Nymphs are the stage of tick development that occurs after they have had their first blood meal and molt, and before they become adults. About 200 species of ticks live in the United States. Some of these can transmit infectious diseases, such as Lyme disease, to pets and humans. Lyme disease is caused by a bacterium transmitted through the bite of the deer tick, also called the black-legged tick, which is no larger than the head of a pin. Typical symptoms of Lyme disease in dogs include joint soreness and lameness, fever, and loss of appetite. Symptoms in humans include fatigue, chills and fever, headache, muscle and joint pain, swollen lymph nodes, and a red, circular skin rash. When buying a flea or tick product, it’s important for pet owners to read the label and follow the directions carefully. There can be serious problems with the misuse of dog flea and tick control products containing the insecticide permethrin. Dogs can tolerate concentrated permethrin, but it can be lethal to cats. Never use products on cats that are labeled for use on dogs only. If the label states that the product is for animals of a certain age or older, don’t use the product on pets that are younger. Flea combs, which can pick up fleas, flea eggs, and ticks, may be useful on puppies and kittens that are too young for flea and tick products. Talk to your vet about the flea and tick product most appropriate for your pet. The product you use will depend on your pet’s health and age, whether your pet is a cat or a dog, and whether it’s an indoor or outdoor pet. Also check with your vet to determine whether the Lyme vaccine is right for your dog. Read the label carefully before use. If you don’t understand the wording, ask your veterinarian or call the manufacturer. Follow directions exactly. If the product is for dogs, don’t use it on cats or other pets. If the label says use weekly, don’t use it daily. If the product is for the house or yard, don’t put it directly on your pet. After applying the product, wash your hands immediately with soap and water. Use protective gloves if possible. If your pet shows symptoms of illness after treatment, call your veterinarian. Symptoms of poisoning may include poor appetite, depression, vomiting, diarrhea, or excessive salivation. Store products away from food and out of children’s reach.